If this were a typical press release, for a typical summer group show in NYC, we might pontificate about how the Art World is steadily failing, and give examples of its slow and embarrassing demise due to ruthless marketeering, commodity art trading, and corrupt price-fixing by the major auction houses. We would make clever references to The Decline and Fall of Western Civilization, in film and book form, and liberally sprinkle in heavy quotes of apocalypse and doom from Nietzsche, Kazantzakis, and Homer’s Iliad. 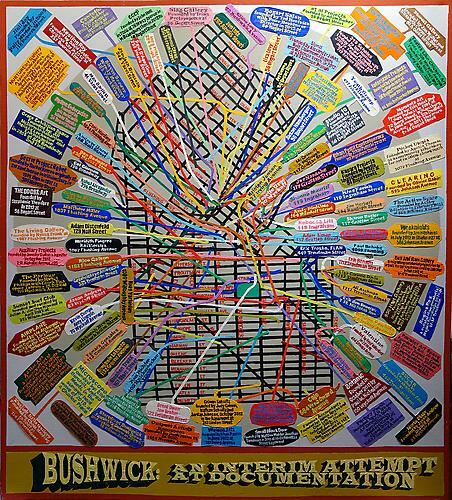 Alongside a friendly dose of art world critique, the show features a roomful of Loren Munk’s fascinating network paintings, including Bushwick, an Interim Attempt at Documentation (2012-2013, oil on linen, 60 x 54 inches), which is pictured above. Other artists in the feisty (but not acutely objectionable to potential collectors) exhibition are Alex Gingrow, Karen Finley, Michael Scoggins, William Powhida & Jade Townsend. Additional reading: ArtNews has published their annual 200 Top Collectors list in the summer issue. The Decline and Fall of the Artworld, Part I: The One-Percenters, Freight & Volume, Chelsea, New York, NY. Through August 17, 2013.